Bassist Dave Zinno and his ‘Unisphere’ have released an absolutely stunning version of a Glen Campbell classic. 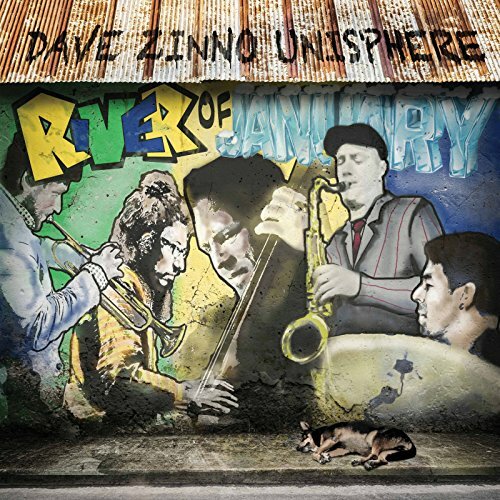 Dave Zinno Unisphere, River of January album. ‘Wichita Lineman’ is perhaps one of the most covered songs of all time. Providing he still owns the publishing rights to the song, it’s quids-in for the song’s composer, the legendary Jimmy Webb. Webb wrote the song in 1968, and gave the song to Glen Campbell, whose version became a Top 10 pop hit in both the UK and the US. Since then, the song has been covered by everyone from Smokey Robinson & The Miracles to Johnny Cash to Campbell’s own daughter, Ashley Campbell. Even Jimmy Webb has recorded a few versions of the song. Most recently, one version has caught our attention, that of the Dave Zinno Unisphere band. Zinno, a bassist who also teaches at the University of Rhode Island, has put together an outstanding collection of musicians as part of his ‘Unisphere’. The group have released their first album, River of January, on Whaling City Sounds. The band includes Zinno (bass), Mike Tucker (tenor saxophone), Leo Genovese (piano melodica), Rafael Barata (drums) and Eric “Benny” Bloom (trumpet). The album is an artistic triumph, featuring some exquisite playing from Zinno and the band. It might be Zinno’s band, but he allows each of the group members to explore and showcase their talents. The whole album is a delight, but their version of ‘Wichita Lineman‘ is outstanding. Tucker’s saxophone playing is truly wonderful, combined with the poignant piano of Genovese. While there’s been so many covers of the Jimmy Webb/Glen Campbell classic, it’s rare that one comes along that excites as much as the original. Dave Zinno Unisphere’s version certainly excites. For more information on the album visit the Whaling City Sound website. You can listen to the song on Spotify, and you can check it out on iTunes or Amazon.